Anthony Olcott, an associate at the Institute for the Study of Diplomacy, Georgetown University, and a scholar at the CIA’s Center for the Study of Intelligence, has lately published a remarkable book with the above title, the nineteenth book-length manuscript he claims to have completed, and the fourteenth that was published. A book which appears not only to be the most current, but, to date, also the most comprehensive publicly available study on OSINT by an author who gained first-hand experience in academia as well as intelligence without falling prey to either profession’s biases. Therefore it comes as no surprise for the reader to find a truly fascinating text both academically rigorous and peppered with first-hand intelligence experience, i.e. an eloquent and informative account of “how open source information has traditionally been used in the intelligence community [and] how dramatically the availability of information has changed” the game. Still, it does certainly not qualify as a hands-on practitioner’s guide, but rather as an invitation to follow and challenge the author’s reasoning, to reassess one’s own assumptions regarding the ever-changing information environment and the oftentimes difficult relationship between analysts and decision-makers, and – ultimately – to start asking “better questions”. The book’s recommendations thus primarily address shortcomings within the (U.S.) intelligence enterprise which does not belittle its value for those readers outside. Olcott reminds us that not every question can be answered by more or even better information, since – in the words of Gregory Treverton – “no evidence can definitely solve mysteries because, typically, they are about people, not things”. Analysts must be aware of the limitations in forecasting and educated guessing, especially concerning strategic intelligence, and they must not be hesitant to declare those vis-à-vis their ‘clients’. Also, nowadays analytical problems frequently arise out of too much, rather than too little information available on a given topic. At the same time, the very definition of OSINT remains controversial, yet the author implicitly tends to support the approach also taken by this blog in describing OSINT “as the systematic collection, processing, and analysis of publicly available and legally accessible, relevant information in response to governments’ intelligence requirements addressing national security” (Schaurer & Störger). OSINT is here seen as a source which comes at a “variety of forms”, and not so much as a distinct type of information. Alongside variety, volume, velocity, vectors, veracity and verifiability of information need to be thoroughly scrutinized, and Olcott adds yet another unexpected ‘V’: the vulgarity of information. He writes: “Scholars who study the development of printing have argued that one of the most important consequences of Gutenberg’s invention was that it made it possible increasingly to give knowledge a taxonomy, and therefore a hierarchy.” It were the internet and “cheap media” obscured with noisy ephemera to become “powerful agents of ‘vulgarization'” that eventually displaced such top-down world, and made the analyst’s life a lot harder. Or, as the distinguished Leon Fuerth from George Washington University rightly puts it in his endorsement for Olcott’s book, “open-source information is not just more information about what is going on: it is what is going on”. Finally, Olcott’s concluding observations on the “paradoxes of choice” and analytical heuristics or, as he calls them, “decision shortcuts”, should be read in conjunction with Roger Z. George’s and James B. Bruce’s 2008 volume ‘Analyzing Intelligence‘, arguing for intelligence as a “profession of cognition” with “the sharing of data, hypotheses, interpretations, and questions among analysts, and other non-government experts possibly [being] where the most insightful cognition is occurring”, both with regards to open and non-open information. So while the “networked world” is nothing really new under the sun, it must serve as a constant reminder for us to adjust our focus on the function of information, and not on its kind. Secrecy alone is no value added, today less than ever. 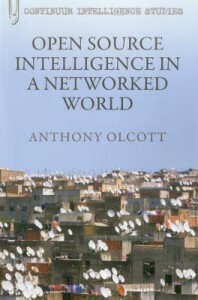 Olcott, Anthony (2012): Open Source Intelligence in a Networked World. This was written by Florian Schaurer. Posted on Wednesday, September 26, 2012, at 18:14. Filed under General. Bookmark the permalink. Follow comments here with the RSS feed. Trackbacks are closed, but you can post a comment.